I strongly believe in getting teachers to use their personal lives to motivate their students (you don’t have to reveal all!) and also getting teachers to make their own materials for teaching. The two go hand in hand. So here is a Lesson In A Can (one of 100s available to EFL Classroom members) that is an example of such and has some info. about me and my treadmill exploits. I’ve used this in my own classes and I hope it will inspire teachers to make lessons based on their own lives. I guarantee, students will be super interested! 1) Warm up the group with the song / video “Here it Goes Again” See the lyrics and handout for the song. At the bottom are the words for playing Last One Standing. Put those words on the board. Get students to copy one word in big letters with marker on a sheet of A 4. The class stands up and when they hear their word/phrase, they sit down. If they hear it again, they can stand up. Last one standing wins! Also play in groups, so a whole group can win. 2. Ask about exercise and what students think the hardest thing to do would be. Climb Everest? Swim across the ocean? etc…. Then read together this article about my treadmill record. Discuss the vocabulary and students complete the exercises. (also find the article in the lesson handouts below). 3. If your students are higher level , you might get them to try the BreakingnewsEnglish “Exercise Pill” activity. Just play the video or cloze of the story and click underneath on the article to get the Breakingnewsenglish activities/worksheets. Get more videos that compliment BreakingnewsEnglish lessons HERE. You might find interesting this blog post – Using The Guinness World Record book as Curriculum. Here’s an additional few articles about my record breaking. 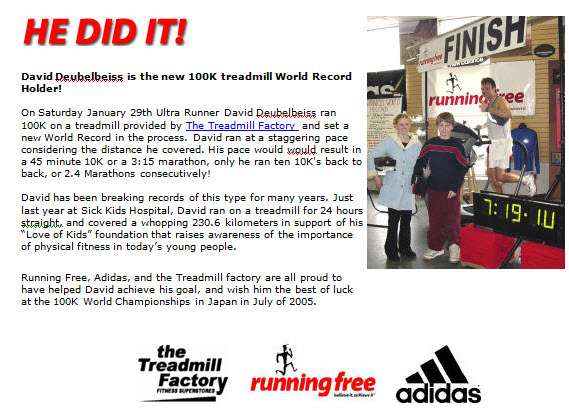 Treadmill Champ Inspires Kids To Be Fit | Roadrunning Magazine: David | 100k World Treadmill Record | Why dont kids climb trees? 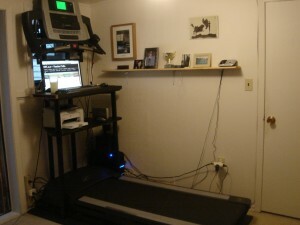 Here is the treadmill desk I used for years at home. I’d work on my computer, online projects and walk miles! Might inspire students.